Dissolves to relieves cravings and nicotine withdrawal symptoms. To help you stop smoking. Suitable for light and heavy smokers. 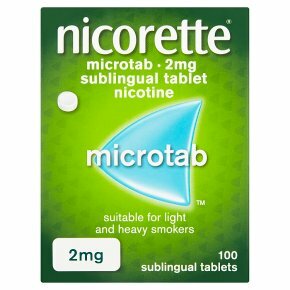 Use: Nicorette® Microtab is for the relief of nicotine withdrawal symptoms as an aid to giving up smoking. It is used to help smokers ready to stop smoking immediately and also to help smokers who need to cut down their cigarette use before stopping. Directions: For adults and children 12 years and over. Do not chew or swallow these tablets. Place 1 or 2 tablets (as required) under the tongue and allow to dissolve. Repeat hourly to a maximum of 40 tablets per day. Before use please read the information leaflet carefully. You are more likely to quit smoking when using this product with help from your pharmacist, doctor, a trained counsellor or a support programme. Please read the enclosed leaflet for instructions. Warning: Do not take more medicine than the label tells you to<br>If you are pregnant, talk to your doctor, pharmacist or nurse for advice before using this product. If you need any advice before starting to use this product, talk to your doctor, pharmacist or nurse.<br>Do not use if you are allergic to any of the ingredients listed below.<br><br>Keep out of the sight and reach of children.